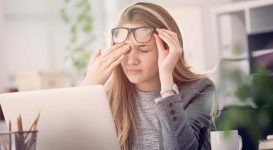 Migraines are universally associated with pain — whether they suffer from the affliction or not, most people understand that the throbbing headache can be unbearable. But other symptoms, though nearly as prevalent, are sometimes glossed over. Migraine nausea is one of them. If you’ve felt the throbbing pain and gut-wrenching discomfort at the same time, you know just how debilitating a migraine can become. 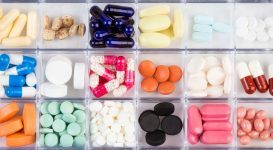 In fact, the nausea can be harder to handle than the headache itself, and will almost certainly interfere with your ability to do basic daily tasks, like eating, drinking, and taking medication. You don’t need to simply suffer through the nausea and vomiting that come with an attack. Instead, turn your attention to relieving the nausea with some proven strategies, and take back some much-needed control in your battle against migraine pain. How Common Is Nausea With Migraine? Unfortunately, migraines tend to be a full-body ailment. Throbbing head pain is the primary symptom, but many people experience pain elsewhere, along with general fatigue and more specific digestive distress. In fact, up to 80 percent of migraine sufferers report nausea with their migraine, sometimes to the point of vomiting. 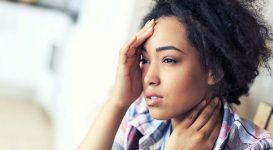 More women than men suffer from migraines (18 percent and 6 percent of the American population, respectively), and many women find their migraines increase when their hormones are fluctuating. 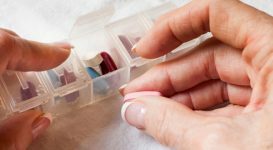 Doctors have long suspected that estrogen plays a role in migraine pain, and since women are also more likely to experience nausea with their migraine, it’s possible that estrogen influences how the stomach responds, too. Migraine pain is thought to come from enlarged blood vessels on the brain, and these blood vessels swell when serotonin levels drop. Interestingly, low serotonin is also linked to motion sickness and nausea, which means too little of this important neurotransmitter could help to trigger migraines and the nausea that comes with them. The nerve impulses that travel from your brain to your stomach can change when the blood vessels in your brain dilate during a migraine. Not only do the nerve impulses cause pain, but they may spark a “fight or flight” response, which closes off the passage between the stomach and intestines to slow digestion. Anything left in your stomach will be trapped, and that will tend to make you feel nauseous. Women and people who suffer from motion sickness are more prone to nausea during migraines, but they won’t necessarily get nauseated during each and every migraine. Textbook migraine headaches can certainly bring on nausea, but more often non-headache migraine variants will make you sick to your stomach. 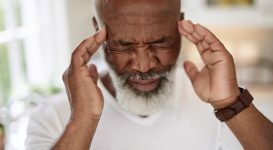 Migraine without aura: Migraine headaches can be broadly divided into those with aura (the vision disturbances that are precursors to the migraine) and those without. Migraines that begin without an aura – which are the most common type – more often bring nausea along with severe head pain. Abdominal migraines: Seen in children more often than adults, this peculiar form of migraine causes pain in the stomach and intestines rather than in the head. The pain usually comes with nausea and vomiting, which can last for a few hours to a few days. Children who suffer from abdominal migraines often develop the common migraine headache variant in adulthood. Cyclic vomiting syndrome: Another condition that targets children more than adults, cyclic vomiting syndrome is an unnerving cycle of nausea and vomiting that can go on for days. Cyclic vomiting syndrome and regular migraine headaches share some of the same triggers. Vertigo and dizziness also lead to nausea, and they are both part of the long list of migraine symptoms. Since nausea can severely impact your daily life, and frequent vomiting can bring about another set of health concerns (like dehydration and damage from stomach acid), it’s obvious that you need to treat your nausea as seriously as you treat your migraine pain. Next page: Tips for finding migraine and nausea relief. My Dr gave me Zofran to take so I can hopefully avoid an ER visit. Nausea is sometimes the worst part but also glad to hear others mention the fatigue and pain in other parts of the body. My experience is pain on my entire left side with numbing fatigue preceding the onset of the attack. Hard to get doctors to understand. My last one had nausea/vomiting as well as full body twitching, that monster lasted six days, today was the first day I've started to feel normal again.